Chinese actress, Fan Bing Bing (范冰冰) was present at the Versace Fall 2012 Haute Couture collection held at Ritz Hotel in Paris, France on July 1, 2012. Dressed in a yellow leather dress with silver panels from Versace Fall/Winter 2012 collection, she styled her look with black patent pumps and bag from the designer. 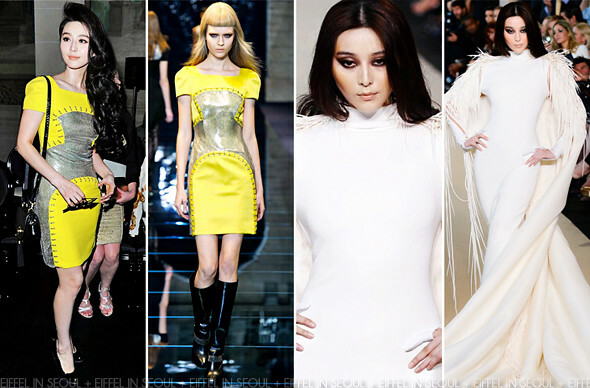 Fan Bing Bing (范冰冰) was also present at Stéphane Rolland Fall 2012 Haute Couture show as a model. She closed the show in a figure-hugging cream dress with fringe details and a dramatic train. Absolutely stunning. Check out the video below to see her walk.